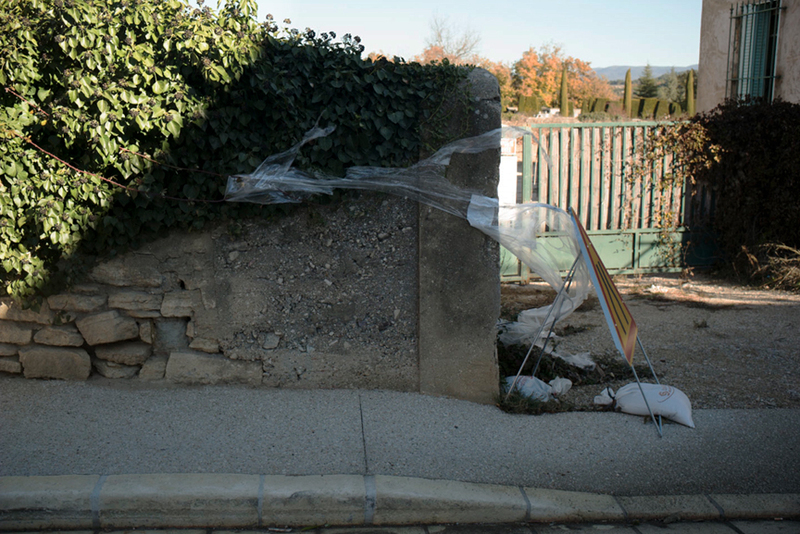 This entry was posted in On the Road and tagged France, From The Car, Provence on December 6, 2015 by joelmeyerowitz2014. 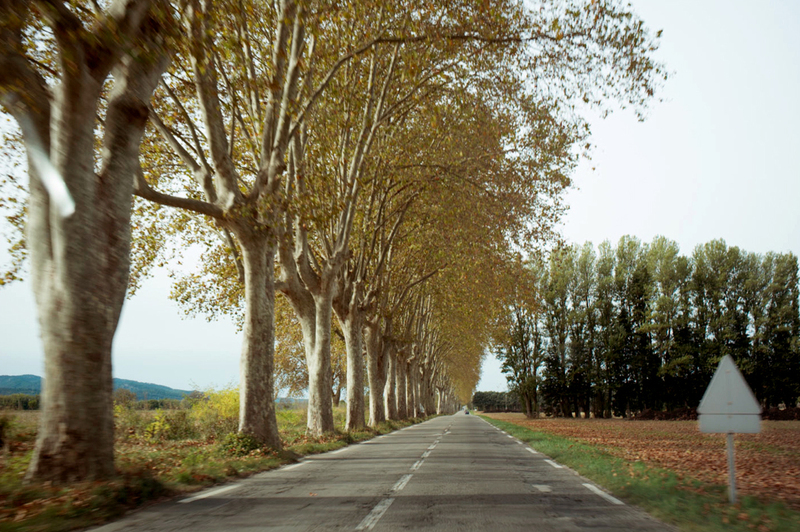 This entry was posted in Photographs from the car, Provence, Trees and tagged From The Car, Provence, Road on November 6, 2015 by joelmeyerowitz2014. 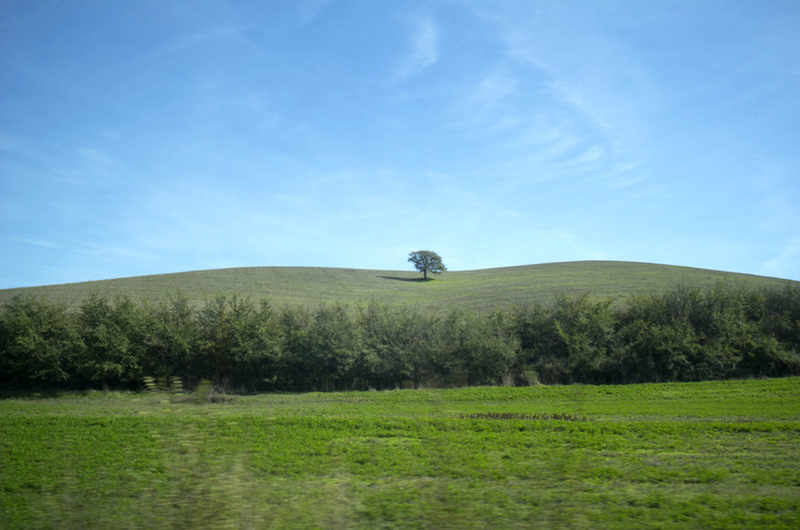 This entry was posted in Photographs from the car and tagged From The Car on November 5, 2015 by joelmeyerowitz2014. A lazy mist drifted through and over the valleys that the road rolled through, so that at times I was above the clouds and then down under them. It felt a little like flying. And it was dreamy too, in that same way that flight can make you feel when passing through the clouds at 30,000 feet. Up ahead the mist spooled across the road, and the moment felt timeless. The thing that separated me from the old world, it seemed, were the little pings of reflected light to mark the borders of the road. Out there was timelessness, inside the modern machine, with a camera in my hands, I could make a photograph at 50 mph and still get good quality, and a degree of sharpness that tells me how good our technology really is. It is important to be able to count on it that way and thus not have any fear about what the outcome will be. I’ve basically used the same equipment for 50+ years. I don’t keep changing cameras, or go into the equipment mind set searching for the latest toys. For me the Leica and a good 35mm lens, and that’s all I need to say what I see, and to stay open to the act of seeing the world freshly. 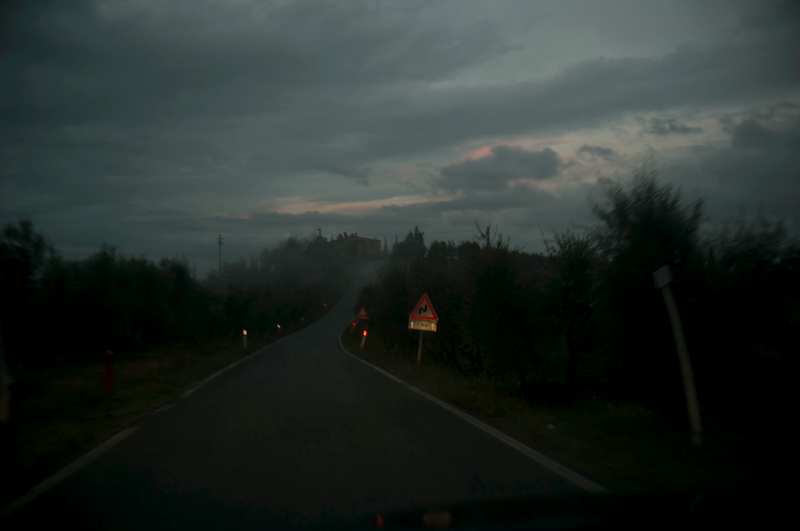 This entry was posted in Evening light, Light, Mist, On the Road, Photographs from the car, Tuscany and tagged evening, From The Car, Landscape, Road on September 30, 2015 by joelmeyerowitz2014. The stuff that people advertise themselves with! Why this crazy bird? Why so big? 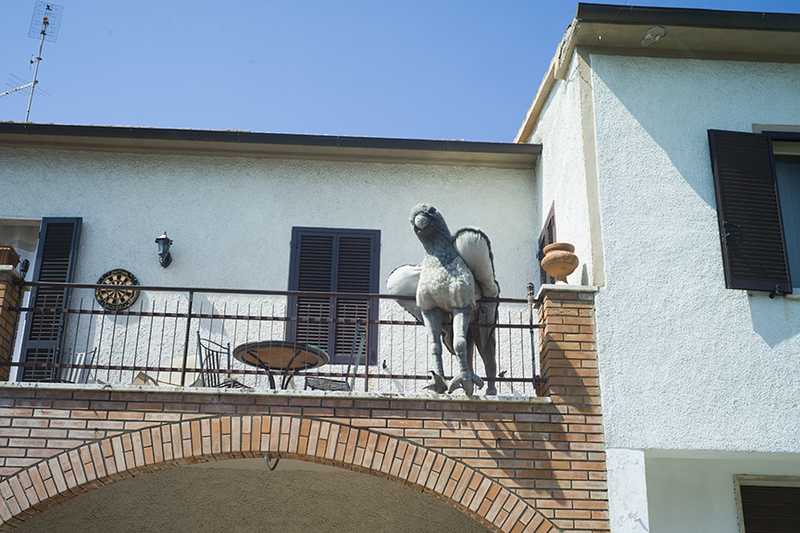 Why hang it over a balcony? 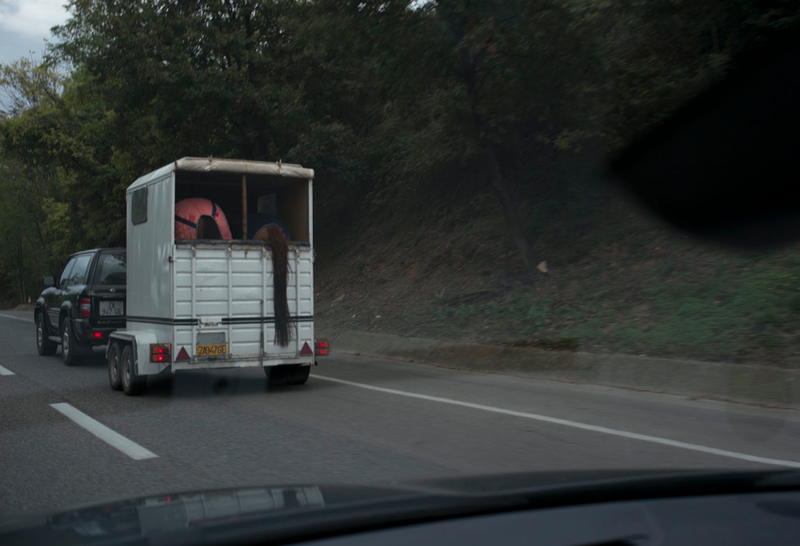 This entry was posted in Italy, Photographs from the car and tagged From The Car, Italy on August 15, 2015 by joelmeyerowitz2014. 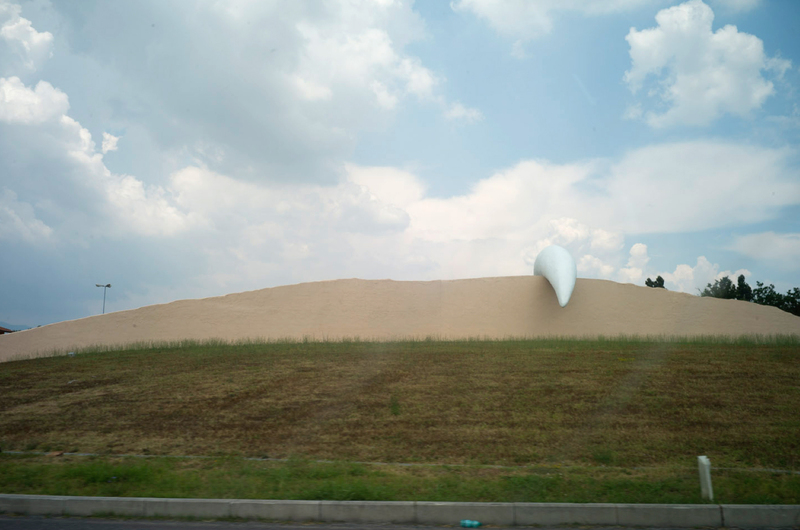 On the way back from Lucca, shooting from the car as I often still do, this earthen berm with a.. …..what is that thing anyway… sticking over the top of the berm like a droopy schnoz, called out to me and made me laugh. The reason I think some photographs have a surreal feeling is that the world is surreal more often than we might think it is. Is this someone’s idea of art? Is it an industrial site with work going on behind the berm and the schnoz lets the gases out? Is it a lost wind sock from a nearby airport come to earth right there? Whatever it was, it made for a moment of visual excitement, a humorous few minutes of speculation, and the feeling that the world is always giving off unexpected pleasures. If you are willing to see it that way. By the time we got home the day was producing its own set of miracles, besides arriving home safely. 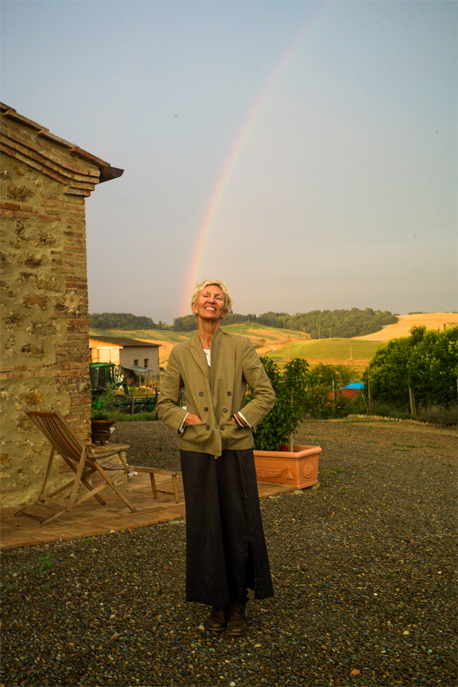 The Tuscan skies, almost as often as the skies over Ireland, produce rainbows of long duration which fall to earth in their own pot-o’-gold, wheat field landscapes. Maggie seems to me to be my very own pot-o’-gold, my good fortune at the end of the rainbow. 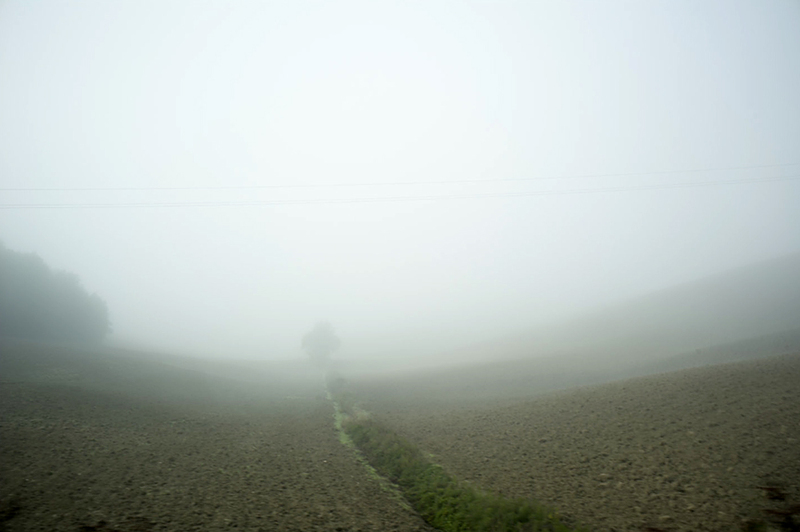 This entry was posted in Italy, Light, Maggie Barrett, On the Road, Photographs from the car, Rainbow, Tuscany and tagged From The Car, Italy, Landscape, Rainbow on July 10, 2015 by joelmeyerowitz2014.